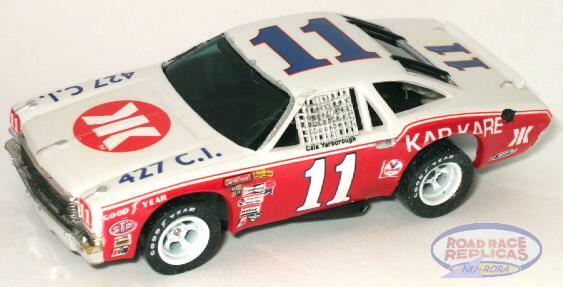 We'll take an AFX Aurora #17 Chevelle and turn it into a great looking stock car. A complete materials list, is available at the end of this article. 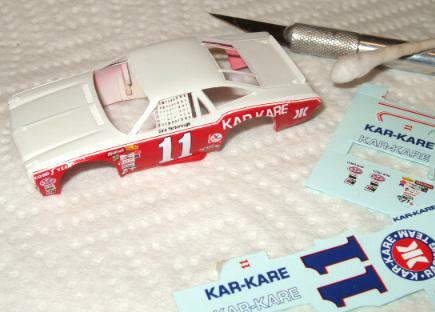 In this tutorial, I'm going to reproduce the 1973 #11 KAR-KARE Chevelle. 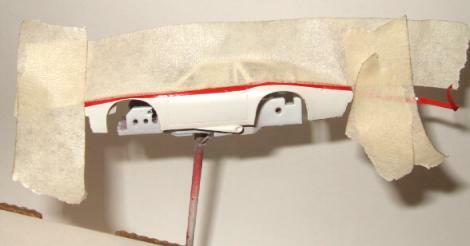 I started with 2 white and orange #17 AFX Chevelle bodies. These are pretty common and inexpensive. First, I removed the glass and front and rear bumpers leaving me with 2 gutted plastic bodies. These were lighted versions so I left the headlights in place. I then soaked the 2 bodies overnight in EASY-OFF oven cleaner. 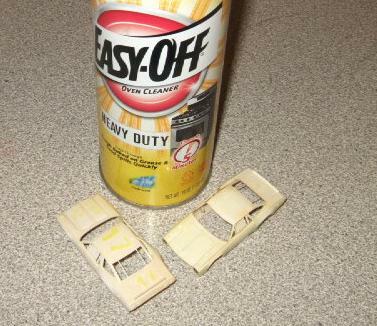 EZ-OFF will attack many things especially chrome so test it first before using. I then, washed the bodies in clean water. I then scuffed the bodies with #600 grit sand paper and removed any lines or burrs I didn't want on the finished body. I also scuffed the entire body to remove any leftover markings giving the bodies a uniform appearance. I then washed and cleaned the bodies giving them a quick blast of air off before I paint the bodies white. I make a paint stand using an old AFX chassis and a wooden cotten swab. 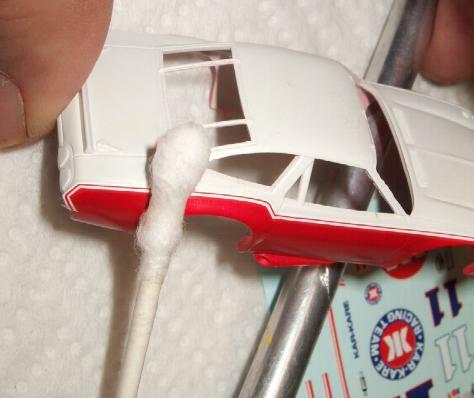 I hot glue the swab into place on the chassis. This makes a great holder/stand for painting and decaling. I have these for AFX, Tyco wide & narrow chassis. I painted the bodies white with DUPLI-COLOR white from my airbrush. I will take DUPLI-COLOR aerosol spray paints and spray the paint into a cup, then pour that paint right into my airbrush's paint cup. It needs no mixing or thinners and it ready to use in the airbrush just as it is. I use a Paasche Model VL-1 airbrush. They are very inexpensive (around $60 on ebay) durable, and solvents won't hurt them. 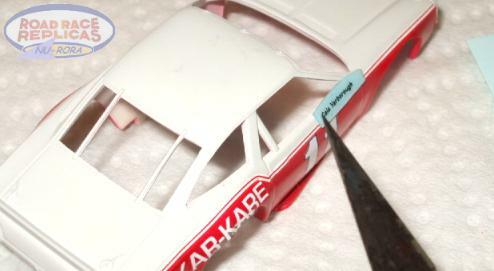 Once the body has been painted, I let it dry thoroughly, then I use 1/16" 3M Pinstriping tape to do the initial masking. This is what professional auto shops use on their cars and it will conform well to contours and edges. I then use standard househole masking tape and apply it over the pinstripe tape. I do this to both sides and then masked over center of car. 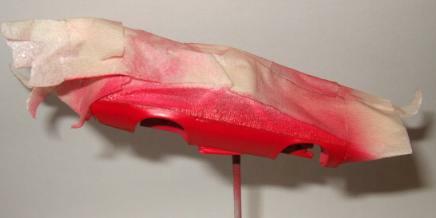 I then shoot with my airbrush the sides and undersides of wheel wells red using DUPLI-COLOR red aerosol paint. I then quickly remove all the masking tapes while the red paint is still "soft". After the tape is removed I can see I had some overspray issues that needed removed. of the window with tape as well to prevent the overspray coming in thru the windows onto the white. 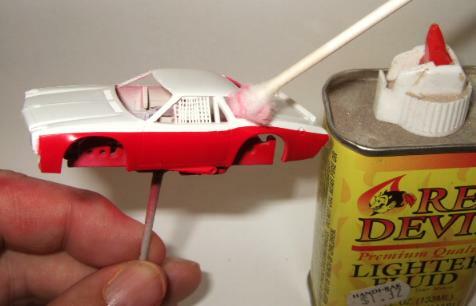 I use good 'ole lighter fluid and a cotton swab to remove the red overspray while the red paint was still "soft". I prefer RED DEVIL brand simply because it doesn't have much odor. I have all my overspray removed and I'm ready to start applying decals. 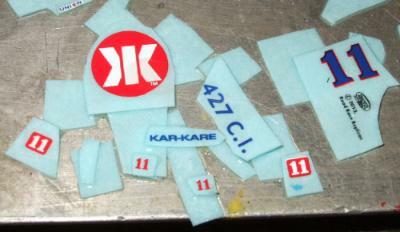 I have a large aluminum plate as a work surface I do all my decal cutting and setting on. I also use a paper towel as to set the body onto when I'm cutting decals, etc. 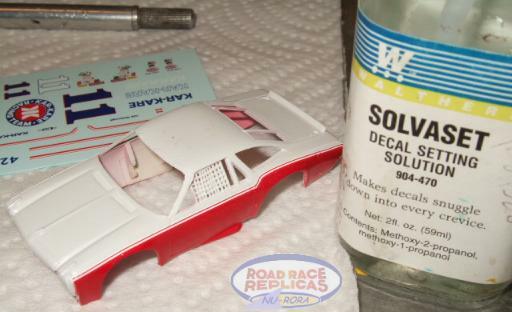 Find a paint guide to follow when applying decals. Have it nearby for easy reference. I start by applying the thin side stripe first. 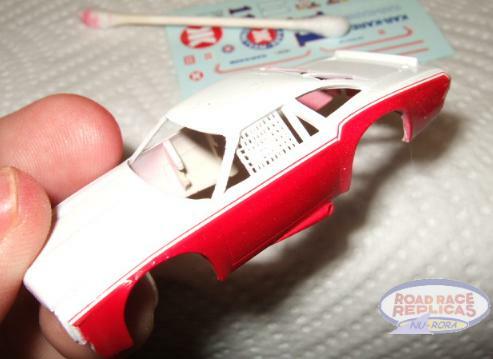 It has extra wide white and red edges to allow for errant red/white paint edges. Cut off the excess on the front edge. Once I have one side applied, I let it dry for about 5 minutes. I then use a decal setting solution, WALTHERS brand SOLVASET. It is "slower" than some other decal setting solutions and after years of experience with this I'm comfortable using it. 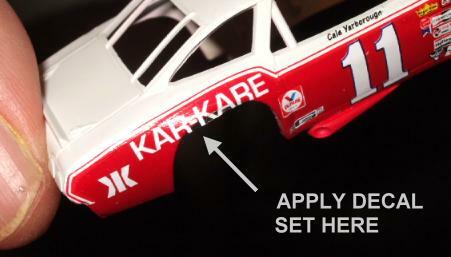 NOTE: DECAL SETTING SOLUTIONS WILL DRAMATICALLY SOFTEN your decals. TEST BEFORE USING! 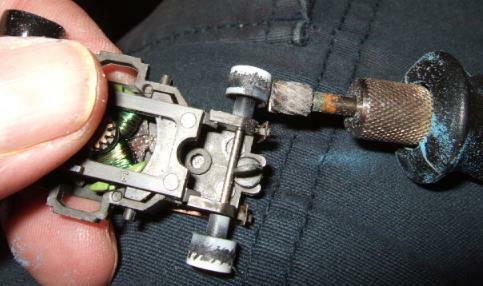 This step is for experienced modelers. I apply the stripe decal, then let it dry for about 5 minutes. THEN, I apply some SOLVASET on 1 section and quickly ROLL the excess solution off with a cotton swab. you MUST roll the swab in a straight and consistent rolling action or it will ruin the stripe. I start in the middle, then roll left, finally I roll right. Then, I do another section of striping. 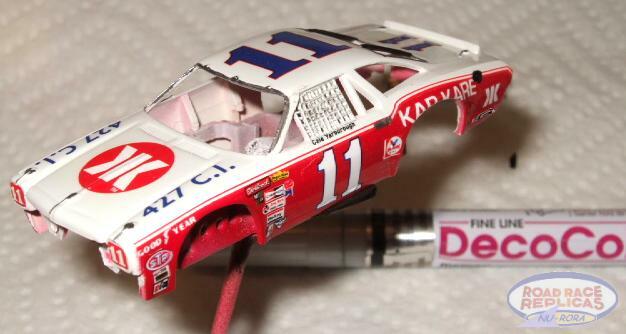 I start applying the rest of the decals on one side of the car body. in the area you want to apply it. Then, slide the name off the backer onto the body. Small images tend to wrap around on themselves sometimes, and this helps to eliminate that. 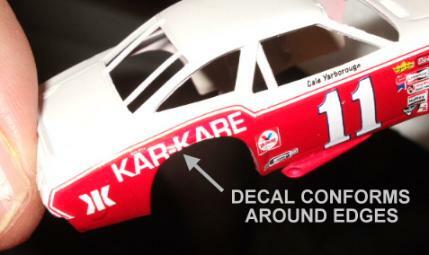 When applying decals over holes like wheel wells, don't worry about the excess or overage. 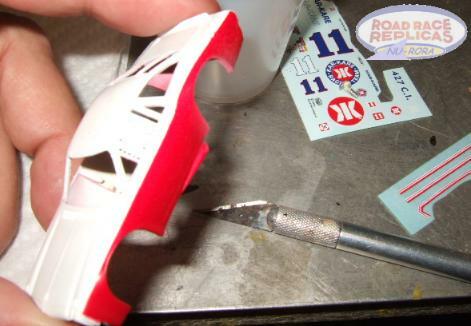 Simply apply some decal setting solution, and the decal will soften and conform to the opening. Once the first side is done, then I moved onto the other side. The other side usually goes much faster. After the second side is complete, I apply decal setting solution to all images and roll off excess. When, I'm applying decals I typically set the newly wetted decals onto the older empty backers. This lets the excess water wick away from the new decals. so keep them wet enough they are workable but not too wet. 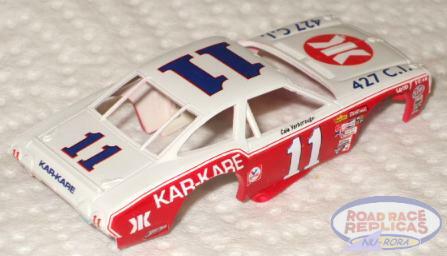 Continue with hood, roof, trunk and front & rear decals. Apply setting solution and roll off excess. LET CAR DRY OVERNIGHT ONCE ALL DECALS ARE APPLIED!!! Simply walk away from it and you'll continue tomorrow. Too many paint jobs are botched here, so forget about it until you can work on it the next day. and gently rub the wet towel over the decals. This removes any extra setting solution or other residue that may be on the car. 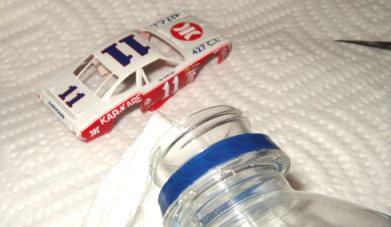 Since the extra residue is often clear, its difficult to see until it shows up under the clear coat applied later. Let dry for at least an hour. I shoot the body with a clear coat now. I spray clear using my airbrush on the body from aerosol paints. I use KRYLON CRYSTAL CLEAR, and also PLASTI-KOTE T-45 clears. Simply spray the paint into your airbrush's paint cup and apply to the body. then finally the top at a final finish gloss coat. I don't typically paint the details in black or silver until after the clear coat. I've encountered silver will turn "fuzzy" edged and dissolve into the clear so I just apply it afterwards. 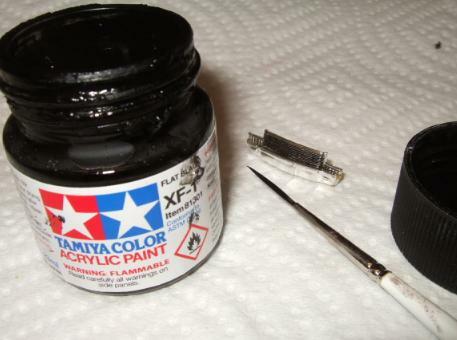 Using FLAT BLACK paint I'll do any details with Tamiya acrylic paint. Here, I paint the grill using a brush with "thinned" black paint. I used a silver marking pen for window details, etc. while the clear was still "soft". Otherwise, I'll hand paint silver details with a brush if the clear is "hard". Black details are applied too. I even heavily thinned some black paint and made a "wash" applying it in the window netting area. This is the finished painted body. 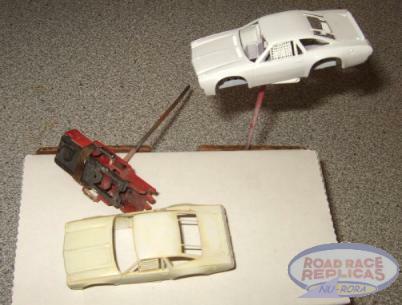 I am using my RRR RWL-S "Goodyear" stocker white letter tires on this car's chassis. YES, you can use RWL tires on AFX wheels with some front wheel hub mods. I ground down the center rib to be flush on the front wheels to clear the front rubber. Rear tires go on with no alterations to hubs. I installed the bumpers and glass with some KRAZY glue. Then, I painted a set of RRR #916 SLOTS white, installing them onto my chassis. And finally the RWL tires give this car the added details it truly deserves. 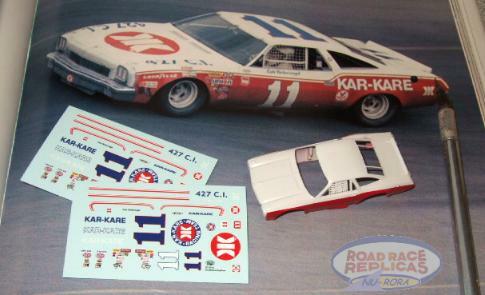 The version I show in my decal/paint tutorial is a SOUTHEASTERN 500 winning car. 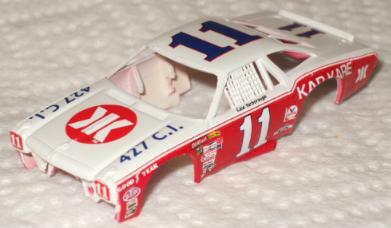 with varying paint schemes and decal placements. 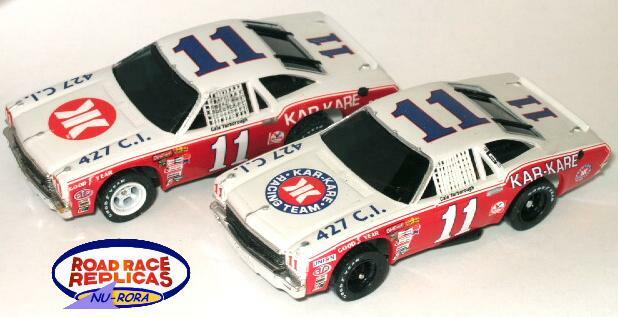 The RRR #N-102 KAR-KARE decals reflect this with several different images on the same decal. Below, you see the more common version (Bristol) parked along side the later Charlotte schemed car. I think they are great looking cars. 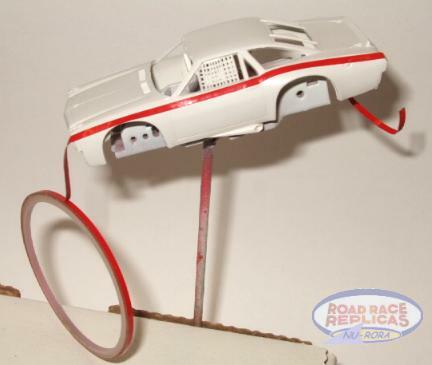 Images and information are not to be copied or reproduced without written permission from Road Race Replicas.